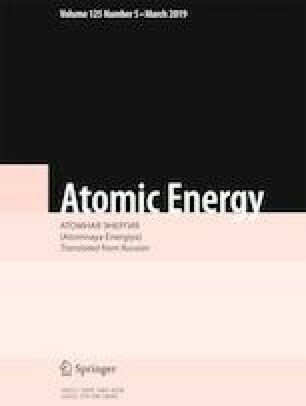 Possible scenarios of nuclear and radiation accidents with the appearance of a hypothetical uncontrollable self-maintaining chain reaction accompanied by emission of radioactive substances into the seawater as well as with the escape of radioactive substances as a result of the corrosion of the reactors are examined. A propagation forecast is made for 137Cs entering the Barents and Kara Seas as a result of accidents occurring at the locations of objects, containing spent nuclear fuel, at the sea bottom and upon being lifted from the bottom and transported to a salvaging facility. The possible scales of radioactive contamination of seawater and bottom deposits, including restricted fishing areas, are determined. The predicted consequences are compared with the admissible norms and the results of discharging of liquid radwaste into the Irish Sea from radiochemical plants in Sellafield (Great Britain). Translated from Atomnaya Énergiya, Vol. 125, No. 6, pp. 343–351, December, 2018.